It's hard to believe but Flåm, Norway was our last Norwegian Fjord port of our 12 Night British Isles / Norwegian Fjords cruise. 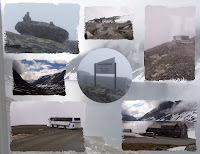 We booked an organized RCCL tour, Overland to Voss, Tvinde & Stalheim. There were two offerings of that tour, one did the train first (as described in the tour description) and the other did the train in the afternoon following lunch. We opted for the latter. Our day began with an early start by motor coach to the Stalheim Hotel. In order to get to the hotel, our motor coach had to navigate spectacular hairpin bends of Stalheimskleivane, the steepest road in N orway. Whenever we take a tour like this, I remind myself why I don't attempt to drive in foreign countries. Our bus driver did a wonderful job getting us to our destination safely. Once there we entered the hotel for coffee, tea, and cakes. We had plenty of time to explore on our own, taking in the splendid views of the Naeroy Valley, the river that runs through it and the magnificent waterfalls that graced the mountain walls. Words cannot describe the scene adequately, so take a look at our Stalheim photo album for some pictures we took. Descending down the windy mountatin roads, our motor coach continued the tour to our next destination, Tvinde Waterfall. As you can see from this picture, the waterfall cascades down the mountain side. There are rocks at the foot of the waterfall which make for great portrait shots with the waterfall in the background. As usual, I left the photography to my husband who really loves taking pictures on our cruises. Once again, I suggest that you view the rest of our pictures in the Tvinde photo album. 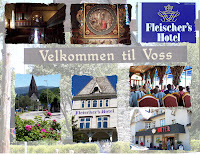 We had time for a quick refreshment and then we reboarded the motor coach for our trip to Voss, where we would have a traditional Norwegian Lunch Buffet at the Fleischer's Hotel. Following lunch we had time to explore the quaint town of Voss before heading to the train station for our trip back to Flåm. In the center of town is Voss Church - Vangskyrkja which was built between 1271-77. It is still in use today. There is a small charge if you want to enter the church and take photos. My husband paid the fee and included in our Voss photo album, you'll find photos of the interior of the church. 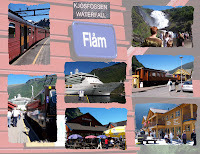 Our all day tour continued via the Flam Railway from Voss to Myrdal Station. We changed trains in Myrdal. There was enough time between trains to explore the gift shop at the station and get some ice cream. Make sure you get some ice cream when you are in Norway - it was one of our favorite things to do. The final highlight of the tour was the photo stop at Kjosfossen Waterfall . We were allowed to disembark the train to get close up pictures of the magnificent waterfall. I have to admit, this is the first time I've been on a train which stopped for photos. The waterfall powers the Flåm Railway. For more pictures of the train trip from Voss to Flåm see our photo album. Our train pulled into the station at Flåm. 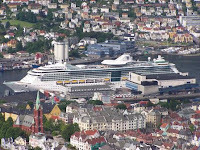 As we disembarked the train, we could see the Jewel of the Seas docked just a short walk away. There was some time for shopping in the stores by the pier before boarding the ship for our final sail-away in Norway. We had a day at sea the following day, then on to our final port, Amsterdam, Netherlands before returning to Harwich, England. I hope that you've enjoyed your trip to the Norwegian Fjords. It's not quite the same as being there in person I know, so I do hope you get there some day. Fear not, this past year, we had another cruise which included the Norwegian Fjords, so in future articles, I'll tell you about that trip. Recall from last time that we left the Jewel of the Seas in Geiranger, Norway for an all day tour, Journey to Briksdal Glacier . Usually you begin and end your tour in the same port of call, but that isn't the case with Geiranger. The ship stayed there for most of the day so people could stay in town if they chose to. At 3:30 PM, it set sail for Hellesylt, where the majority of the passengers, who'd been on tours, would rejoin the ship. Hellesylt is a small village in the Stranda Municipality, which is a part of the Møre and Romsdal County in the western part of Norway. Our motor coach arrived in this little town and parked near the dock where we would board a tender boat to rejoin our ship. Our tour was behind schedule, so we didn't have much time before we had to board the tender boat. The site of the village on the mountain sides at the end of the Sunnylvs Fiord is exceptionally picturesque. Right through the centre, 100 meters from Grand Hotel, the Hellesylt waterfall gushes down into the Fiord. This waterfall is one of the most photographed sites in Norway. Of course, we were obliged to get a few pictures of our own. Our ship awaited, so it was time to board the last tender boat, click a few more pictures of the watefall and of our ship, and get ready to sail for our next port of call, Flåm. We once again took advantage of our aft balcony cabin and relaxed on our verandah as we sailed away (see photo album). Our 12 Night British Isles / Norwegian Fjords cruise continued to be an exceptional cruise with wonderful memories. 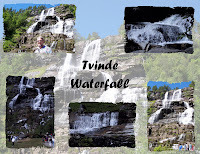 When updating my website, and posting to this blog, I can't help but recall those fabulous days in the Norwegian Fjords. I do hope you get to experience this magnificient country some day. I've left you imagining the Norwegian Fjords long enough. I can assure you that the picture you have in your mind is about to be surpassed. To the left is a picture from our balcony as we arrived in Geiranger, Norway. The stillness of the morning was broken by the sound of rushing water. The ship doesn't dock alongside a pier in Geiranger. Instead, the ship uses its lifeboats to tender the passengers ashore. We booked the Journey to Briksdal Glacier RCCL shore excursion so we were one of the first passengers to disembark the vessel. We boarded our motor coach and drove through the small village of Geiranger arriving at the Flydal Gorge (approximately 1,000 feet above sea level) where we had a fantastic view of the fjord and ship below as you can see in this picture. Look how small the Jewel of the Seas looks in the middle of the fjord. From this overlook, we continued our journey up the mountain to Dalsnibba which is at 4500 feet elevation. Dalsnibba is a mountain in Møre og Romsdal, Norway. 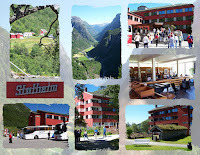 It is located above the town of Geiranger, 7 km away from Geirangerfjord. It offers very good lookout opportunities and thus is a very popular tourist destination. Dalsnibba is often covered by the snow even in the summer. It is hard to tell whether you'll have a good view until you get to the mountain top. Unfortunately, there was extensive cloud cover and fog when we arrived. It did start to clear as we descended the mountain peak. Note the hairpin curves that the motor coaches had to make. There were times when one bus had to back up to allow another one to pass. It sure makes one glad they aren't the driver. Even with the overcast sky, the view was amazing. Our tour continued as we drove down the mountain on our way to Briksdalen Mountain. When we arrived at at the Briksdalen Glacier, we disembarked the motor coach and entered Briksdal Inn for a typical Norwegian lunch. Following lunch we had free time to explore the glacier on our own. There are three ways to get near the glacier - walking, riding in a horse cart, or riding in a jeep. Regardless of the method you choose, you will still need to walk on rugged terrain to get close to the face of Briksdal Glacier. Since we had limited time there, we opted for transportation by jeep. There is a nominal charge for both the jeep and the horse cart, so make sure you have some cash. You will definitely want to have a good pair of hiking shoes. Here is a closeup of the glacial ice for those of you that haven't seen a glacier before. You'll notice the telltale bluish tint to the ice. It is possible to go onto the glacier itself, but it isn't practical with the limited amount of time during this particular organized tour. You probably wouldn't guess that we weren't on the glacier when we took this closeup picture. With today's cameras, it's possible to get great photos from a distance. We have two albums with pictures from this shore excursion. 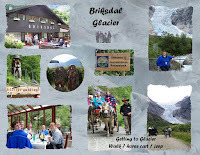 See our Geiranger album and Briksdal Glacier album for some more photos of this wonderful port of call. Our tour wasn't complete at this point in time, so next time I'll tell you about our trip back to Hellesylt where we rejoined our ship. 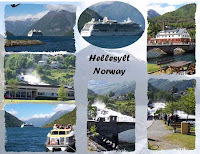 Sailing northeast of Bergen, Norway, our 12 Night British Isles / Norwegian Fjords cruise on RCCL Jewel OTS took us to the West Norwegian Fjords region. A fjord is a long, narrow bay with steep sides, created in a glacially carved valley that is filled by rising sea water levels. As our ship entered the fjords, we looked on in amazement at the rugged terrain that rose on both sides of the ship. Our 90,090 ton ship was dwarfed by these formidable mountains. The water was very calm and stillness filled the air. The only thing that broke the stillness was the sound of rushing water as it plunged from one of the magnificent waterfalls. Even though it was mid-June, several of the mountain peaks were crowned in white snow that glistened in the sunlight. Close your eyes for a moment and imagine that you are standing on your balcony or one of the ship's decks looking out at the scenery that engulfs the ship. You are not afraid, but instead this calm comes over you as your breathe in the fresh crisp air. You pinch yourself because you aren't sure if this is real. You have just experienced Mother Nature in all her glory. I have not posted any pictures in this article. I've done this so that you can use your imagination and paint a picture of the fjords in your mind. We watched the Jewel of the Seas online as it was built, and eagerly awaited it's maiden voyage to the Norwegian Fjords. We had months of anticipation before seeing the fjords. I'll only keep you in suspense until my next post. We aren't the only ones that think the Norwegian Fjords are spectacular. UNESCO has included the Norwegian fjords on the World Heritage List -- The Geirangerfjord and Nærøyfjord now enjoy the same recognition as the Great Wall of China, the Great Pyramids of Egypt, Zambia’s Victoria Falls and the Grand Canyon in USA. By their inclusion on the World Heritage List, the Norwegian Fjords will be protected for generations to come. Come along with me in my next post to Geiranger, Norway. I wish you Peaceful dreams of fjords until then. In my last post, I talked about the last British Isles port on our 12 Night British Isles / Norwegian Fjords cruise. After leaving Scotland, we had a day at sea before arriving at our next port, Bergen, Norway. We awoke to a perfect picture postcard day. Up until this point in time, the weather had been on the cool side. You might recall it was raining in Edinburgh, just two days before. As you can see from this picture, the sky was powder blue with whisps of white clouds. What great contrast to the colorful buildings along the Bryggen (Norwegian for the wharf). RCCL offered a shuttle bus into town for a nominal charge. It is possible to walk to town, but due to the layout of the dock area, it's actually much easier to take the shuttle bus. The first thing we did was walk to the Fløibanen Funicular where we purchased round trip tickets to ride the tram to the top of the mountain. The view from there is spectacular so we took several pictures, include this one of the Jewel OTS surrounded by the town of Bergen. You can visit as long as you like on top before your return ride. Bergen is a city that you can easily explore on your own. We continued our self-guided tour by walking to the Bryggens Museum, a museum based on the findings of the archeological excavations of Bryggen between 1955 and 1972. A short walk from there is Bergenhus Fortress where you can tour Håkon’s Hall and the Rosenkrantz Tower. Bergen - Sail Away After doing our sightseeing, we did some shopping on the Bryggen. It is possible to do Duty-Free shopping in many of the shops. There are a number of shops that allow you to pool your purchases to meet the minimum requirements for a refund. Read my blog post "Shop Unitl You Drop" for more information about Duty-Free shopping. We also spent some time relaxing in one of the outdoor cafes. Prices for food and beverages are quite high in Norway. If you don't want to spend alot of money for a meal, I'd suggest making a purchase in the Fish Market. If you like ice cream, you need to taste their soft serve ice cream - it's the best. What a wonderful day we had in Bergen. We couldn't have asked for better weather. There was even a fashion show going on in the center square (which is near the shuttle bus pickup point). Make sure you have some comfortable walking shoes since you'll want to wander through the city enjoying the colorful scenery. Up next - the Norwegian Fjords. Continuing with our 12 Night British Isles / Norwegian Fjords cruise, our next port was Greenock (Glasgow), Scotland . 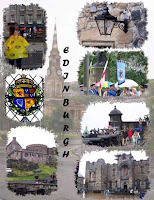 This was our second time in Greenock, so we decided to do a tour of Edinburgh, the capital of Scotland, on our own. Edinburgh is about 45 minutes away, via ScotRail, from where we docked. Since RCCL was offering a bus transfer to Edinburgh, we decided to use that option instead. Should you decide to use the ship's shuttle to Edinburgh, you need to be aware that a fair amount of walking will be required from the unloading point to any of the attractions, such as Edinburgh Castle. As the bus pulled into town, we passed by the castle, so we had no problems determining which way to walk after getting off the shuttle bus. It was raining, but that didn't dampen our spirits as we walked to the castle. When we got there, a parade was underway. We watched the parade and then went into the castle grounds to begin our exploration. We spent several hours touring the castle, had some lunch, and then checked out the local stores before retuning to the bus pickup location. Some other popular attractions in Edinburgh are Palace Of Holyroodhouse , the Scott Monument, the New Parliament Building Information Centre, the Lauriston Castle, and the Nelson Monument. 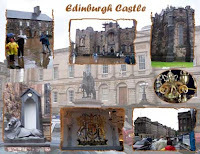 For more pictures of Edinburgh Castle, see our Kodak Gallery album. There are additional albums posted under the Gallery drop down on my Scotland page of our Cruise Vacations website. See that page for links to other planning resources and information about our previous trip to this area. Continuing with our 12 Night British Isles / Norwegian Fjords cruise, our next port of call was Belfast, Northern Ireland. About a month before our cruise, the itinerary was changed from Dublin to Belfast due to the EU Summit meetings that were taking place near Dublin. We were disappointed, because my husband's father was born in Dublin, and we were looking forward to visiting that area. Belfast turned out to be an excellent replacement far exceeding our expectations. Prior to the cruise, we were active participants in the Cruise Critic Roll Call thread for this sailing. When we learned of the change in itinerary, the group searched for an alternative tour and found a local tour company, Minicoach, that offered a tour that included The Giant's Causeway, Carrick-a-Rede Rope bridge, Bushmills Distillery, and a photo stop at the remains of Dunluce Castle. One of our group contacted them and arranged a minibus tour. When we arranged the tour, we were scheduled to get into the port of Belfast in the morning, however prior to sailing, the time got changed to 2:45 PM (and in fact we were later than that in the end). We were quite fortunate to have a tour company that was willing to work with us. Since we would be in port until the wee hours of the morning, we had plenty of time for sight-seeing even with the late afternoon arrival. The sun didn't set until 10 Pm, so lighting was not a concern. Bushmills Distillery was no longer possible since we couldn't get there before the final tour of the day. All the other sites were still possible. Our first stop was at The Giant's Causeway. The Grand Causeway is pictured above. We arrived at the Visitor's Centre where we learned about the causeway which was formed 60 million years ago from lava. From there we boarded a bus which transfers us to the site of these magnificent basalt columns. The scenery here is breathtaking. The Giant's Causeway is a Natural Heritage Site and the 8th Wonder of the World. Pictures and words just don't do it justice, but for some more pictures, see my photo album and also click on both of the links above. (Nov. 2013) The coastal scenery is a beautiful. We are in the process of moving images from the old Kodak Gallery album to our Shutterfly account, so some albums may not yet be available. We made a brief photo stop at the sight of Dunluce Castle. Although we didn't do so, it is possible to take a guided tour of the castle grounds. For a few additional pictures, see my photo album. Our final stop was in town for some dinner and drinks with our fellow cruisers. We picked up some ice cream cones for the trip back to the ship. For some final pictures, see our End of Tour Album. All these albums are linked on our Cruise Vacations website. This was a remarkable port of call. It's four years since the cruise and our Cruise Critic thread remains active. It's funny that several people just posted and mentioned our Belfast tour and the Giant's Causeway in particular. I hope that you can some day see this in person. The busy holiday shopping season is now behind us. By now, hopefully you've gotten all the post-holiday bargains, exchanged the gifts that didn't fit, spent some of you gift card money, and have gotten shopping out of your system. But, perhaps you really love to shop and instead are missing shopping already. Not to fear, there is hope for those that love to shop. I'd like to suggest a new venue for your shopping excursion. Shop while on a cruise. There are plenty of opportunities to shop during a cruise vacation. This picture shows some of the shops onboard Caribbean Princess. If you didn't know bet ter, you might think that you were inside a neighborhood mall. There are a few keys to having a successful shopping experience during a cruise. Many cruises ago, we decided that we'd dedicate at least one cruise for some holiday shopping. On our Baltic cruise, we decided that we'd buy gifts from Russia for everyone on our Christmas list. Some items were purchased onboard the ship, but the majority of the items were purchased on land during our private tour. By shopping during a cruise, you are able to purchase unique gifts that will have a lasting meaning for the recipient. In the picture above, taken in Bergen, Norway, you could purchase some hand-made items for someone on your list. Of course, don't forget about your collections and yourself while doing your shopping. A happy shopper is an educated shopper. I strongly encourage you to do some research prior to your cruise. There is a wealth of information available on the internet. 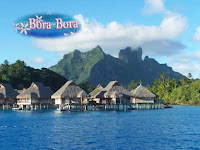 In our Cruise Vacations website, there are several links provided under the Shopping category. You'll want to be able to answer the following questions: What is the best bargain in this destination? What unique items can be purchased here? What are the custom limitations? What are the duty-free rules? How do I get the taxes refunded? Are there items that I am not allowed to bring home (such as Cuban cigars if traveling to the U.S.)? Are there local markets where I can purcahse hand-made items? One advantage to shopping while on a cruise is that you can take advantage of duty-free shopping. You'll want to know what your custom limits are and also how to get refunds of Value Added Taxes (VAT) you might pay. Sales tax / VAT is included in the purchase price and can make up to 20% of the price tag. It is important for you to undertand how to obtain a refund. For example, in the UK, there is a VAT added to all purchases. You need to complete a form to obtain a refund of the taxes. For the latest information on Value Added Tax (VAT) see the HM Revenue & Customs website. In Norway, you will see TAX FREE shops during your visit. The thing to note is that there is a minimum purchase amount to qualify for a refund. As of this writing, the minimum purchase amount is NOK 315 on regular goods. While in Bergen, we found that several of the stores were actually associated together and you were allowed to "pool" you purchases to get the refund. On some itineraries, a customs agent is located at the pier or onboard the ship to process tax refunds. This is a great benefit that you'll want to utilize if it's available on your cruise. Check with Guest Relations onboard if you need assistance. Often the ship will do a shopping briefing and/or have brochures with recommended stores. Watch your daily paper for details about shopping talks or special sales onboard the ship. Sometimes there are specials offered in the various stores for ship passengers. Most ships will offer a guarantee on merchandise purchased in one of the recommended stores. That's not to say you should restrict your shopping to those stores, but if you do, you'll have the added security of the cruise line assisting you with any problems that occur after the sale. The final thing I'd like you to consider is the ship itinerary. Obviously, if you are looking for a particular item, it will most likely be easy to determine which cruise to select. One thing that you may not have considered is the oboard ship inventory and how a change in destination might be a benefit to you and offer bargains. For example, the last cruise to a particular destination (and possibly cruises that follow) may offer an onboard discount as they clear out merchandise to make room for the new destination's merchandise. Take for an example, a cruise that visits the Baltic during the summer and the Caribbean during the winter. After the last Baltic cruise, they will want to clear out the Russian and other Baltic country's merchandise. So, if you want some Russian trinkets, but aren't able to get there this year, perhaps the first Caribbean cruise after the Baltic might be a good one to consider. I hope this gives you some ideas about planning for a cruise vacation that includes some shopping. Again, I strongly suggest that you do some homework prior to your cruise so that you can have an enjoyable time and get some good deals. Check on the web, talk to your cruise specialist, read the shopping information, and attend the shopping talk(s) onboard the ship and you should be in good shape. Last month I started to tell you about our 12 Night British Isles / Norwegian Fjords cruise on Royal Caribbean's Jewel of the Seas. I've already talked about our pre-cruise stay in London, and our first port of call LeHavre, France. In this post, I'll share our experiences in Cork, Ireland. This was our second time in Cork, the first being on September 13, 2001, just after the World Trade Center attacks. If you'd like to read about our first visit, you can do so on our Path of the Vikings cruise web page. This trip, we booked a private tour with 16 other passengers with West Cork Tours , a local tour company. They tailored the tour to our desires. 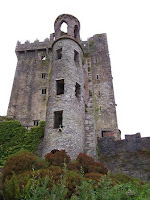 Pictured above is Blarney Castle, our first stop on the tour. Upon arrival at the castle, we had a one hour guided tour of the castle grounds. The castle could be seen in the distance. A vast green field, so common in this part of Ireland, lay in front of us. We followed the path to the castle and then continued into the gardens. The path wound thru the gardens, past rock formations, past magnificent tree roots that crossed our path, thru tunnels (good thing I'm short - see picture), and past streams. After the guided tour portion of the tour, we had free time to explore on our own. Some of our group climbed the path to kiss the Blarney Stone. You need to hang upside down to kiss the stone. See our photo ablum for more pictures of this portion of the tour. No trip to Blarney Castle would be complete without spending some time in Blarney Woollen Mills. Here you will find Belleek Irish China, Waterford Crystal, Galway Irish Crystal, Royal Tara Fine Bone China, and other fine Irish merchandise. The best thing is they will ship it home so that you don't have to lug it around the rest of your vacation. Departing Blarney, we drove through the courtryside of West Cork and arrived at our next destination, Kinsale. As you can see in the picture, this is a colorful town with narrow streets, shops and galleries. We had 2.5 hours to explore the town, checking out the local bars, restaurants, and shops. The people here are very friendly. In one shop, the shopkeeper demonstrated the art of blowing glass for us. We picked up some souvenirs and reboarded the mini-bus for our next stop, Charles Fort, which is still in Kinsale. 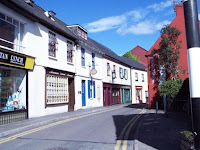 See our photo album for more pictures of Kinsale. 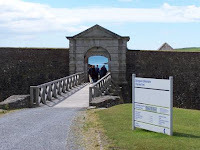 Charles Fort was constructed in the late 17th century and is still in fairly decent condition. This is a classic example of a star-shaped fort consisting of five bastions. We entered through the archway where we were given a brief talk about the fort and then we had 30 minutes to explore on our own. We took several photos while at the fort which can be seen in our photo album. All these albums are hosted on Kodak Gallery. This is a free service, that does require user registration. There's plenty to do near Cork, Ireland. On our first visit, we spent a Day in Killarney including a stop at the restored 19th Century Muckross Manor House. Whatever you do, make sure you explore the Irish countryside - it is a sight to behold. Beginning January 31, 2008, all adult (age 19 and above) travelers will be required to present proof of citizenship, such as a birth certificate, and proof of identity, such as a driver’s license, when entering the United States through land and sea ports of entry. All travelers including citizens of the United States, Canada, and Bermuda are now required to present a valid passport when entering the United States at any airport as of January 23, 2007. This includes children of any age. For more information about this change, see the Dept. of Homeland Security press release on this topic and the Western Hemisphere Travel Initiative (WHTI): The Basics. "Do I need a Passport to go on a cruise?" is probably the most frequently asked question by clients looking at a cruise vacation. My advice is that I'd highly recommend that they obtain a passport (even if less restricitve rules are in effect - such as the first bullet above). a) You are traveling on a cruise after Jan. 23, 2008, and have valid proof of citizenship (other than a passport) as outlined in the first bullet above. You, or a member of your family becomes ill and you need to fly home. Your proof of citizenship (such as drivers license and birth certificate) is now insufficient, since the more restrictive airline rules take effect. b) You miss an airline connection, or don't get back to the ship in time and you need to fly to the next port of call to join / rejoin the cruise. Unless the next port of call is a US territory, you will most likely need a passport to enter the country. (there are some exceptions to this, so if you are a gambler, you could roll the dice and hope you won't need a passport). c) A no brainer situation is one where you are traveling to a country or countries that have passport (and possibly visa) requirement for entry and exit. Check with your travel agent or the country's embassy if you are unclear of the requirements. KNOW BEFORE YOU GO is my suggestion to you. Consult with your travel agent, cruise line, and air carrier to be sure you understand all the rules that govern your trip (including unforseen circumstances such as the examples above). Happy New Year !! Tis the time that many people make New Year's resolutions. There are the obvious choices - losing weight, eating healthy, being kind to people, saving money, spending less money, spending more time with family, etc. I'm going to give you some additional choices - appreciate nature, explore a new location, learn a new skill, meet new people, learn about different cultures, visit a historical location. These are just a few resolutions that can be accomplished while on a cruise vacation. My husband and I have always been nature lovers. I still recall when I suggested an Alaska cruise to my husband. He looked at me as if I'd lost my marbles. Then I showed him some photos of the beautiful scenery and he couldn't wait to get on the ship. This picture was taken during a past Alaska cruise as we cruised the Inside Passage. Here we are sailing past Hubbard Glacier. Alaska is a great place to appreciate nature, learn about different cultures, meet new people, and assuming you haven't been there before, you can explore a new location. I'd be happy to help you plan an Alaska cruise vacation. By the way, I'd suggest adding a pre or post-cruise tour so that you can visit Denali and other locations. I've spoken about some destinations in Europe in some of my past posts. Europe is another destination where you can explore new locations, meet new people, find out about different cultures, and definitely explore historic locations. For those coming from the USA, make sure you add one or two nights pre-cruise so that you can adjust to the time difference and also maximize the long flight. You might think that a European vacation is out of the question due to the value of the USD. This is where a cruise comes in very nicely, since your lodging, meals, and entertainment are a fixed cost. The ship is your floating hotel with all the ammenities you'd expect at a fancy hotel. When in port, you can explore on your own or via a cruise or private excursion. There are many possibilities in Europe that I could suggest. Are you looking for a new destination that offers water sports, scenery, different cultures, and even the possibility of learning a new dance? Then Tahiti might be the place for you. It can still be a long flight if you start your cruise in Tahiti, but it's really not that bad if you spend the night before in Los Angeles, CA. If you've been to the Caribbean before, and love the blue water, then you'll really love Tahiti. Here you'll really be able to appreciate nature in all it's glory. In this land you'll find magnificent waterfalls, beautiful flowers, exotic fish, and black pearls. You'll meet the French Polynesian's who love to welcome you to their homeland. Don't forget to pickup a bouquet of fresh flowers for your cabin before you sail from Papeete. Perhaps you are looking for something similar, but a little closer to home. How about taking a cruise to the Mexican Riviera. You could visit Cabo San Lucas, Mazatl an, and Puerto Vallarta for example. 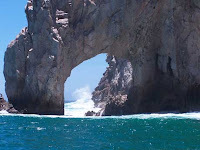 I think Lands End in Cabo is one of my favorite destinations. Here you can take a boat ride and go snorkeling or simply enjoy the beautiful rock formations. It's possible to explore this city on your own very easily. That is probably the best anyway since it gives you an opportunity to meet the people and learn more about their culture. A short water taxi can take you to Lovers Beach where you can unwind and enjoy nature at it's best. These are just a few destinations where you can complete your New Year's resolutions. If you picked some of the traditional resolutions, such as healthy eating, a cruise still fills the bill. Cruise lines have menu choices for the health conscious as well as full fitness facilities to stay in shape during your vacation. As far as my New Year's Resolutions ... I'll continue to write about our past cruise vacations, continue to answer cruise-related questions, visit new destinations (Galapgos is on our list this year), and go back to old favorites (back to Alaska). For those that know me, OK, I'll get back in the gym, eat healthy, save some money (to spend on cruises), and continue to be kind to people. Whatever your resolutions are - may you have a healthy and prosperous New Year.